The southern coast of Australia gave us some sailing conditions. 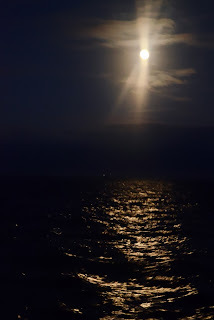 Disregarding the foul weather, the cold and the large seas, we picked moderate to light SE breezes to go out in and hid out for the nasty stuff. In most of the anchorages we had crystal clear water, brilliant clean white sandy beaches or very pleasant, even quaint coastal towns and hamlets to explore. Everywhere we sailed into we met the most friendly people who all gave their own precious time to help us in some way, from sharing local information, lending us the key to a marina gate, giving us a guides tour of their town, inviting us into their homes to the loan of their personal vehicles in a couple of places. Just brilliant! All were so totally interested in our sailing adventures, at times I felt embarrassed by their hospitality, trying to reciprocate by inviting them on board for a meal. Some things are hard to repay especially when people don’t want you to. I know the feeling, we are the same. It’s called pay it forward! Most of the anchorages were nearly always comfortable with exception of our first anchorage choice at Albany, due to the strong winds coming across Princess Royal Harbour and Goose Island (just before crossing the Great Australian Bight, GAB), for similar reasons. The wind changed forcing us to move anchorage in foul weather to the north side of Middle Island. Another problem we encountered in most of the anchorages was the thick seagrass and the extremely hard sand. There was this beautiful anchorage in Spalding Cove near Port Lincoln that was a magic little spot till the weather turned foul. The driving rain pelted the boat, the wild wind whipped the water and then the anchor let go. The anchor pulled out of the thick weedy sand and was not able to re-set. AR was coasting across the bay at a rapid rate. Thank goodness for the anchor alarm. The only answer to the thick weedy bottom was to anchor further out (in 7-8mts) in the thick mud with less weed. I still got no sleep that night. 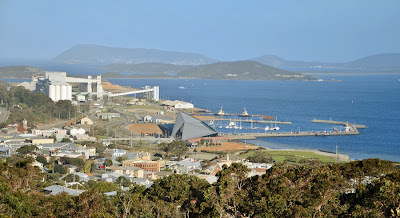 Albany is a port city in the Great Southern region of Western Australia, some 418 km SE of Perth. The city centre is at the northern edge of Princess Royal Harbour, which is a part of King George Sound. Albany was founded on 26 December 1826 as a military outpost of New South Wales as part of a plan to forestall French ambitions in the region. During the late 19th century the town served as a gateway to the gold fields and for many years it was the colony's only deep-water port having a place of eminence on shipping services between Britain and its Australian colonies. Before the 1950s whaling was one of the major sources of income and employment for the population. 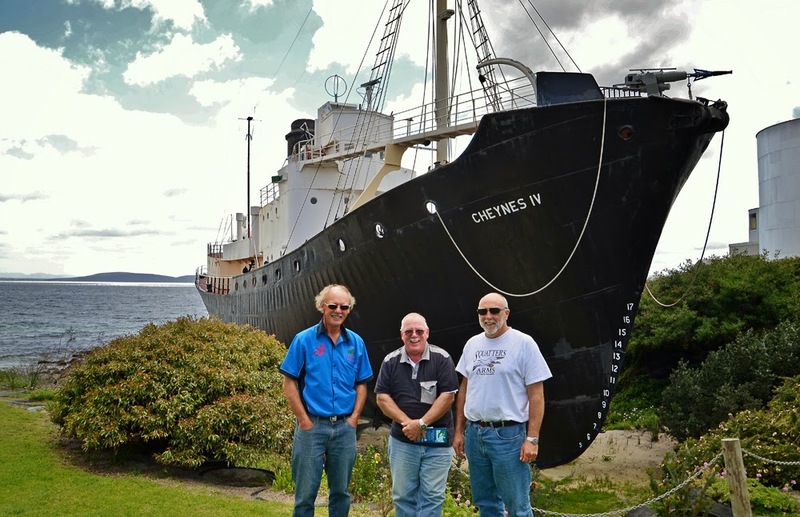 The Whaling Station, which closed operations in 1978, has now been converted into a museum of whaling, and features one of the Cheynes whale chasers that were used for whaling in Albany. The station was the last operating whaling station in the Southern Hemisphere and the English-speaking world at its time of closing. 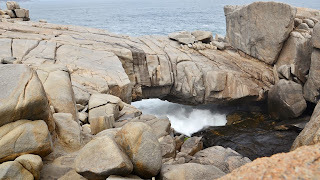 Albany also has a number of historic tourist sites and natural sights especially along the rugged coastline, which includes the Natural Bridge and the Gap. All this we were able to go see thanks to the wonderful friendship of people like Andrea, one of my photography club friends, Ingrid and Geoff, a couple of Shaggers (SICYC) and Mark, another boatie. Two People’s Bay Reserve - Named back in 1803 between a chance meeting between French and American mariners, this nature reserve is a vital sanctuary for threatened birds and mammals. The reserve is widely renowned for the rediscovery of the long thought extinct Noisy Scrub-bird and Gilbert’s potoroo. Wray Bay is located in south Western Australia. The entire bay is undeveloped except for 4WD access tracks and a few old huts at the southern end of Pallinup Beach. 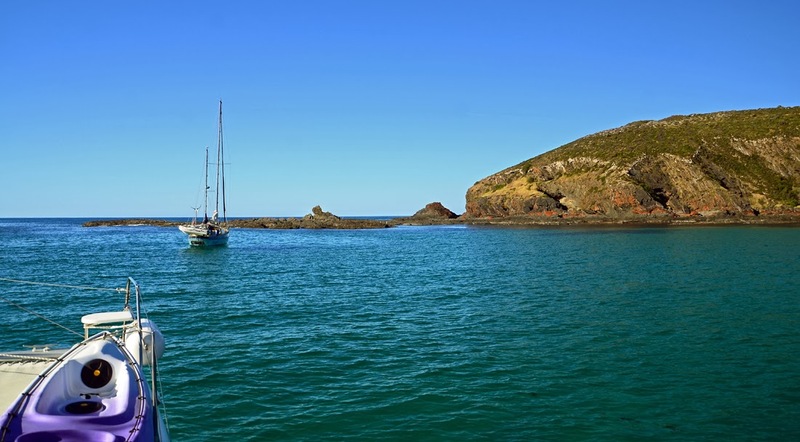 Doubtful Islands Bay - House Beach was the site of first whaling station in WA in1836. There ended up being three whaling stations in the bay. 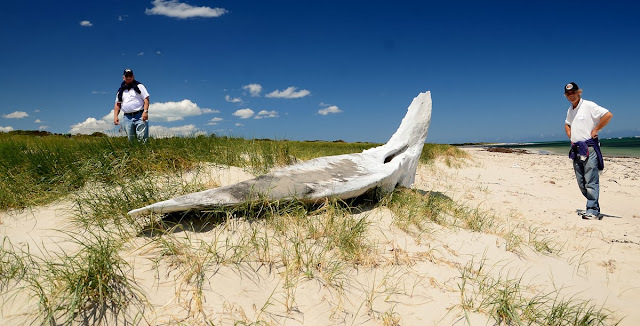 There were 20 whaling stations along the WA southern coastline in the 1800s, including east of Esperance, Cape Riche, Cheyne Beach, Two Peoples Bay, Doubtful Islands Bay and Albany. 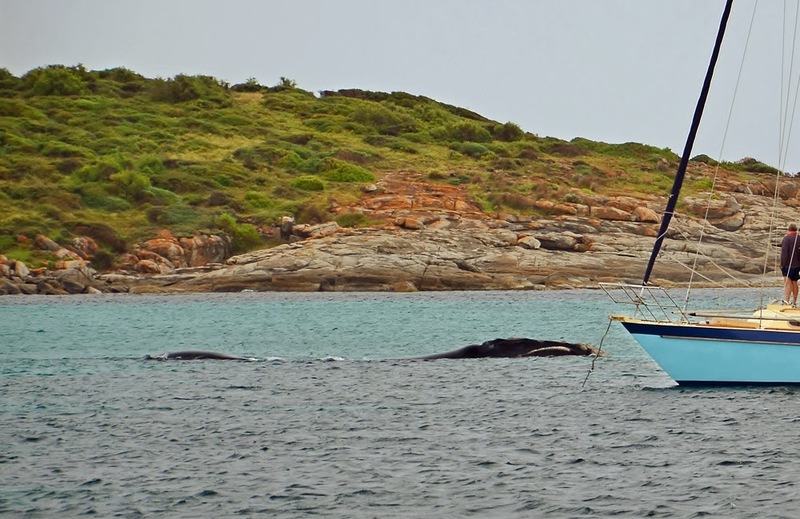 Funny thing happened in Doubtful Islands Bay, with all its whaling history, we were gobsmacked by the visit of a southern right whale and calf. Wonders will never cease! Esperance is another WA regional city along the southern coastline with one of its major industries being tourism. French explorers are credited with making the first landfall near the present day town, naming it and other local landmarks whilst sheltering from a storm in this area in 1792. The town itself was named after a French ship, the Esperance. 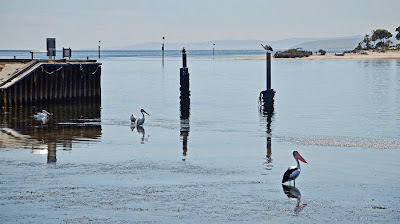 The town jetty was built through the 1890s, following the discovery of gold in the goldfields region. Esperance is most noted for its coastline and has been voted Australia's best beaches, Australia's whitest sand and Western Australia's most popular beach. We had the privilege of being able to tie up alongside the Taylor Street Jetty which is not for free anymore and has no amenities (Closest accessible toilet is located on the Esperance foreshore), while Banyandah got to live in the old YC marina. AR was just too big for the quaint little pens. Tour vessel departs from this jetty. Once again we were unable to anchor out due to the seagrass and the hard sand sea bed. I did get to see some magical sunsets! Duke of Orleans Bay has a long pristine white beach that swept from Table Island at the northern end of the bay to where we had anchored behind Nares Island at the southern end of the bay with a large rock outcrop fair smack in the middle. A beautiful, absolutely stunning location; a pure white, squeaky sand beach leading down to a clear turquoise sea which made it very inviting to swim in except the water was too cold for me. Once landed, we took the track up the hill and were rewarded with a breathtaking 360degree view. Over the hill there was a caravan park at Condingup. Aborigines are believed to have lived in the south west of WA for at least 38,000 years. At the time of white settlement the Goreng (Koreng) tribe occupied the Gnowangerup-Bremer Bay area. The local population was probably quite small as the Aboriginal population of the entire south west corner in 1829 is estimated at 6,000. 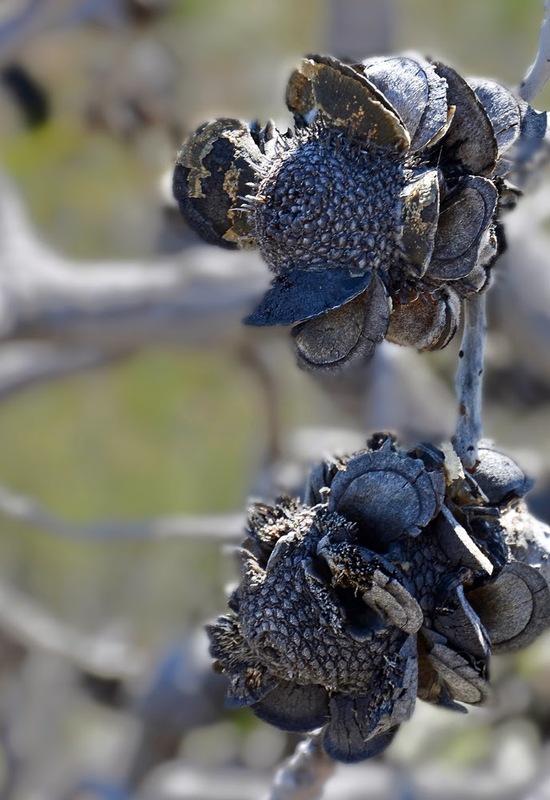 The language spoken was Noongar (Nyungar). According to the Doubtful Islands area coastal plan, Colin Grey shepherded sheep for Hassell’s at Qualup in 1947 and at Doubtful Island Bay in the 1950s. Europeans - The first recorded ship to visit the area was the "Guiden Seepaart" in 1627, captained by F Thijssen (Dutch) and carrying P Nuyts. The first recorded British ships to visit the area were "Discovery" and "Chatham" in 1791, captained by George Vancouver. He named Point Hood and the Doubtful Islands. The first Frenchman was B D'Encrecasteaux in 1792, who was in charge of two vessels "Recherche" and "Esperance". Aboard one of these ships was a Mr. Riche after whom Cape Riche was named. Matthew Flinders was in the area in January 1802 in the ship "Investigator". 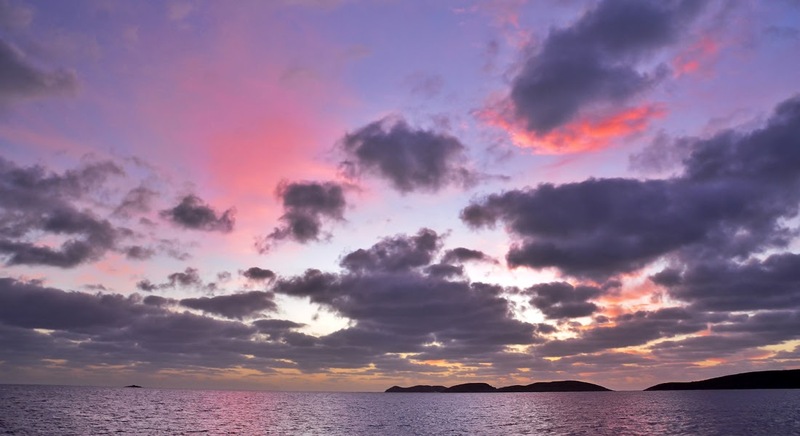 He named Cape Knob, west of Dillon Bay, and proved that the Doubtful Islands were islands by sailing between them. Flinders also named West, Middle and East Mount Barren. Some say that he landed at House Beach and dug a well to obtain water in "well corner" of Reef Beach. This well was referred to as “Whalers well” by early settlers. In July 1842 Edward Eyre (25) and Wylie passed through the area on their journey from Adelaide to Albany. 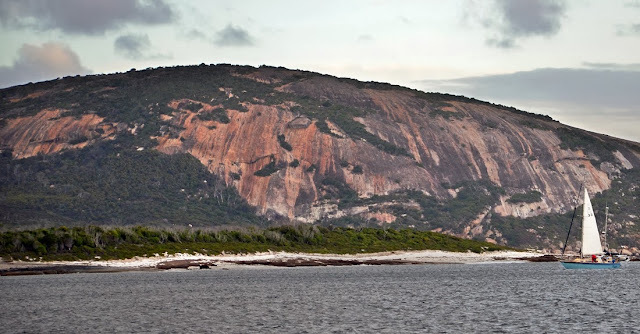 Other early visitors were the botanist Drummond in 1843, Surveyor General J Roe in 1848 (he named the Fitzgerald and Gordon Inlets) and the geologist Von Somner (who examined coal deposits at Fitzgerald River) and the Gregorys in 1849. In 1835, two youths (including Jimmy Newell) walked from Esperance to Albany, a distance of 640 km. During the 1700s and 1800s rabbits and goats were landed on islands in the Albany to Esperance area to provide food for mariners. Construction of the overland telegraph line between Albany and Adelaide commenced in Albany on 1st January 1875 and was completed in less than 3 years. A telegraph station initially operated by Mary Wellstead was established at Bremer Bay c1876. As early as 1897 rabbits were reported crossing the South Australian border into WA. To halt their progress the government commenced constructing the No 1 Rabbit Proof Fence in 1902 from Starvation Bay near Hopetoun, northwards. However by this time rabbits had already moved further westwards, so construction of a second fence (No 2) was commenced from Point Ann northwards. However this failed to stop the rabbits, which by 1914 were reported at Bremer Bay. And we all know how far the rabbits travelled..........................................!!! 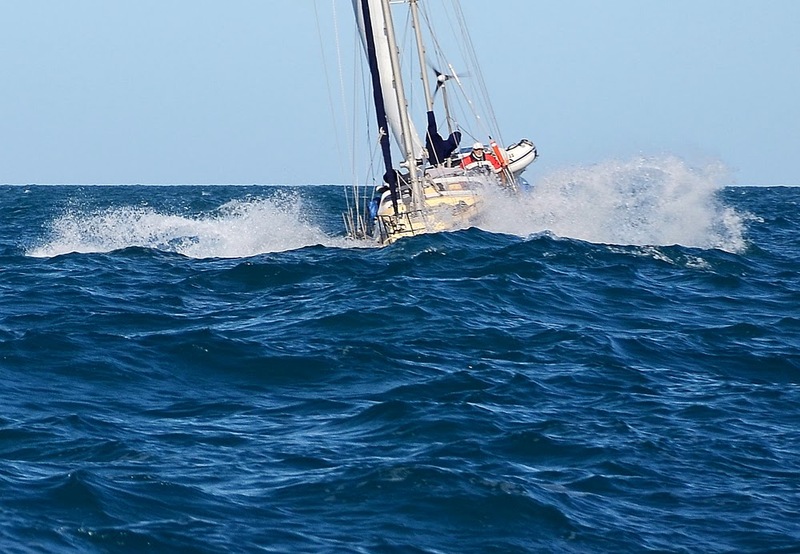 The Great Australian Bight gave us brisk sailing condition for the first two days then lightening off the third and fourth day; taking us 4 ½ days to cross from Middle Island to Spaulding Cove (Port Lincoln). At times I was counting the minutes to the end of my watch; I would be wet through and chilled to the bone, I fatigue much quicker these days and the passage was taking its toll. Other times were outstanding. Memories of night sailing on the end of a Full Moon and then falling into a warm bed, memories of the sea birds skimming the waves to then soar the clouds, memories of hanging over the bow to imaging to be playing along with the dolphins as they danced between the hulls; all these memories are like snapshots embedded in my mind. 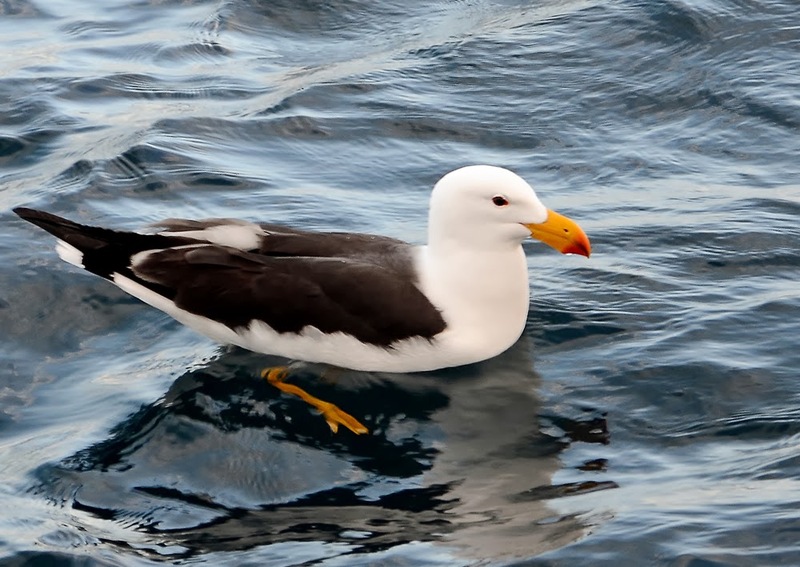 The mighty albatross ("sea gulls on steroids," said Bruce Peterjohn, chief of the bird banding laboratory at the Wildlife Research Centre in Laurel USA) were by now old friends. 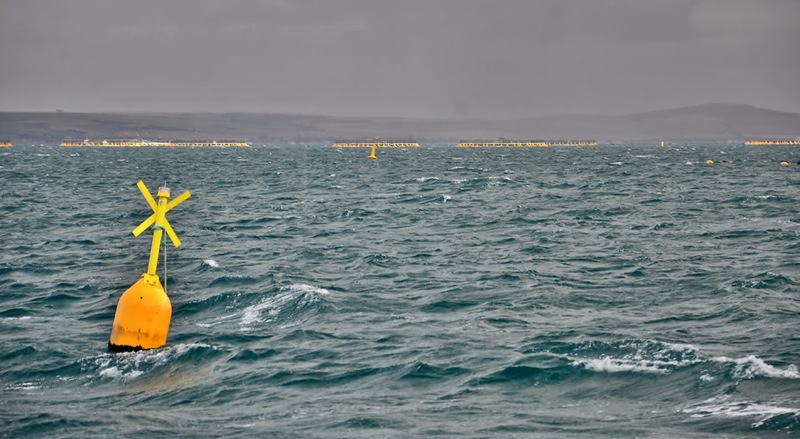 We were sailing in one of the most inhospitable places on the planet. I will always remember sitting inside the saloon wearing four layers of clothing just to stay warm. Oh well! It felt good to be there! The wear and tear on the boat gear during this voyage was huge. 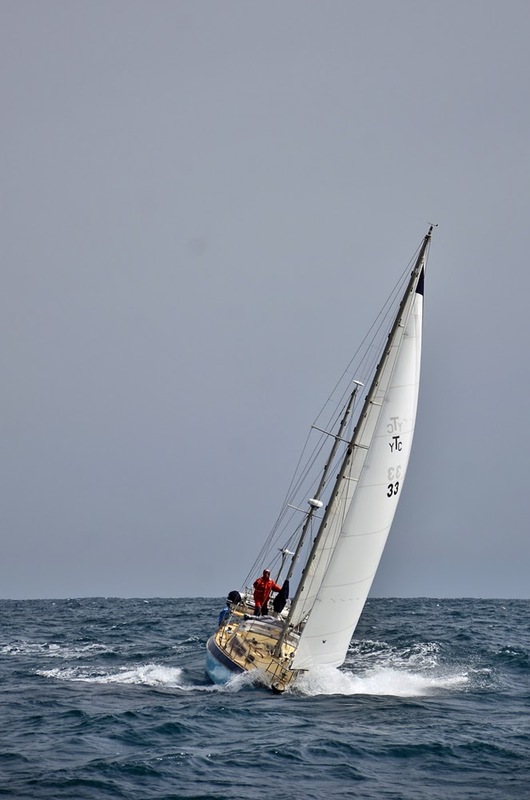 The foresail and the canvas covers in particular took a beating. Small tears and seams becoming unstitched were common. Repairs to the foresail were done in Two Peoples Bay using our old Sailrite sewing machine that we carry on board. 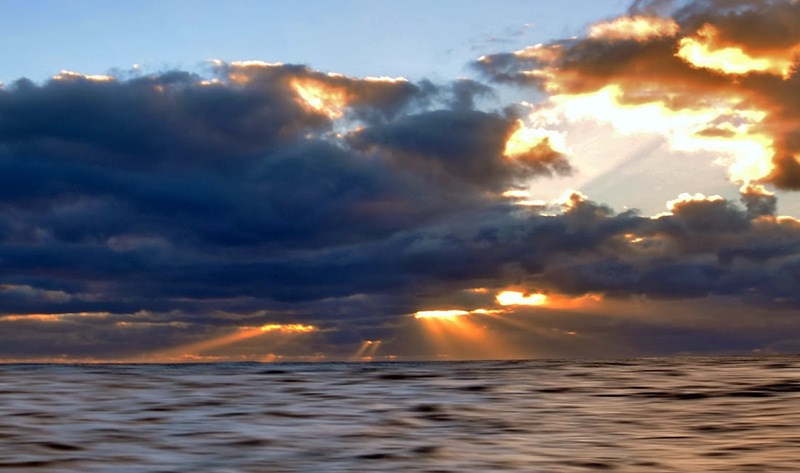 In the Southern Ocean you are far from help; when gear fails you must repair it yourself. The skills, tools and raw materials to do this must be on board. We sailed round the bottom of the Eyre Peninsula where the storm-ravaged southern shore with its rugged rocky coastline has some of the most dramatic scenery I have seen (limestone cliffs, ancient granite outcrops that were washed with undampened surf, magnificent sand dunes, little bays with sandy beaches and a dabble of offshore islands). 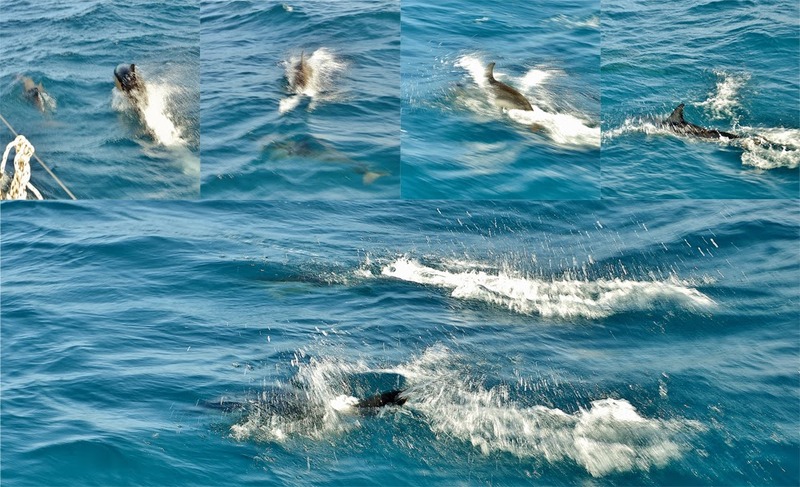 Also the home of the great white sharks and southern right whales frolic in the waters with their young. Eyre Peninsula is a triangular peninsula in South Australia. It is bounded on the east by Spencer Gulf, the west by the Great Australian Bight, and the north by the Gawler Ranges. 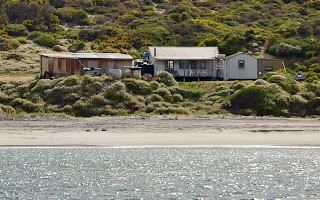 We sailed round Cape Catastrophe up through Thorny Passage between the peninsula and Thistle Island to a calm anchorage in Spalding Cove which is part of the Lincoln National Park only a stone’s throw across from Port Lincoln (10n/m by water). 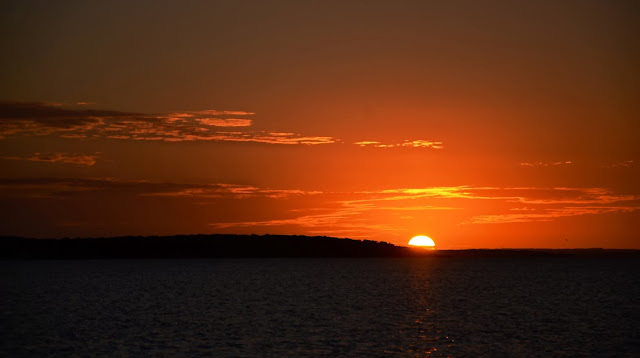 Port Lincoln is located on Eyre Peninsula surrounded by a stunning natural environment. The town of Port Lincoln is set on the shores of Boston Bay, Australia's largest natural harbour. We reprovisioned in Port Lincoln while waiting on better weather. The town CBD is almost on the waterfront making shopping, getting fuel or even dining out a pleasure. Port Lincoln is a fascinating place. It is a major export area sending Grain, Oysters, Abalone, Shrimp and Tuna globally. We all enjoyed the seafood. Huge fishing industry! Port Lincoln is home of Australia's largest commercial fishing fleet. They have developed their Tuna fishing into a fine art. 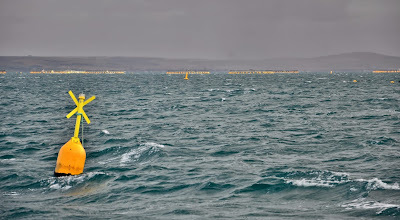 Sending boats deep into the southern ocean, where they net tuna, put it in pens and slowly tow it back to Port Lincoln for fattening up. When the tuna are ready they harvest it and send it to the processing plant for dispatch across the globe. All very scientific these days and I believe they can now breed Tuna. The advantages of this type of hybrid fishing are that it not only offers large employ to the area it also guarantees a consistent fish product for 12 months a year. Its big business! Farming, especially wheat, is another huge business in the area with a major Grain Bulk Loading Facility Viterra, located on the waterfront. 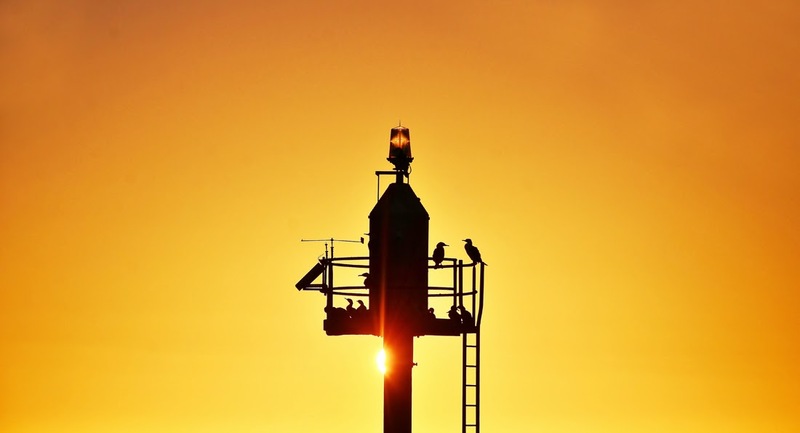 Viterra’s has eight port terminals located at Port Adelaide, Port Lincoln, Port Pirie, Thevenard, Wallaroo, Ardrossan, Outer Harbor and Port Giles. (Grain Loading Terminal) So were anchored of the town between the grain terminal and the town jetty. 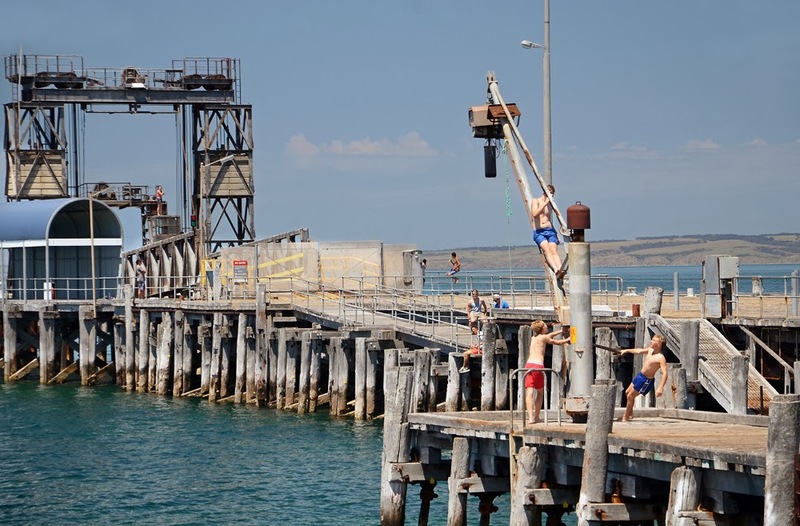 The old town jetty was the first jetty built at Port Lincoln, erected in 1857. It was initially 159 metres long but was extended twice to a length of 222 metres giving a depth of 3.6 metres at low water. Subsequent changes in length occurred before the jetty was closed for commercial purposes in 1936. Now it is a popular fishing spot. Kangaroo Island is Australia's third-largest island, after Tasmania and Melville Island. I read an advertising brochure for the island once - “Freedom isn’t a state of mind, it’s an island. 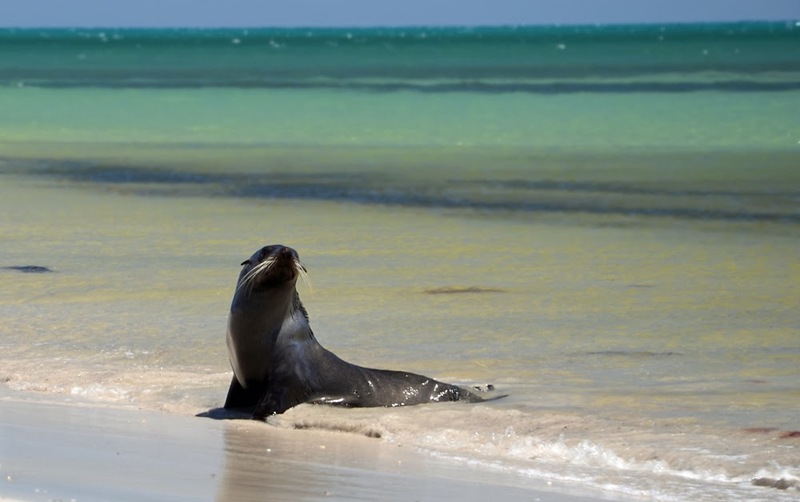 Minutes from the mainland, but a million miles away, Kangaroo Island is a sanctuary for wildlife and natural, rugged beauty.” That about sums it up and some more; a real treasure! Kangaroo Island has a mix of attractive small townships and fascinating wilderness. The Island also has a fascinating History and was almost claimed by the French in 1804. Throughout the nineteenth century various attempts were made to establish a viable industry on the Island. Salt was mined; farmers tried to carve pastoral leases out of the poor soils; eucalyptus oil stills were set up, Yacca was threshed for its gum to produce lacquer and explosives; commercial fishing was undertaken, gypsum mining established itself and the tourism industry began. The agricultural industry has adapted to the poor soil and forestry, sheep dairying, bee keeping and marron farming has become popular. There are still traditional farms but these are diminishing in number as the land is broken up into smaller 'hobby' style farms, making this island an ever changing wonder of lifestyle choices and experimental agricultural pursuits. 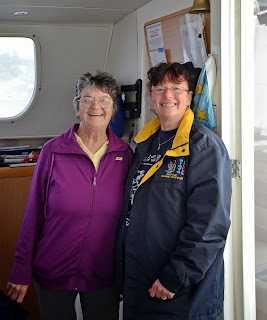 We sailed out of Port Lincoln at daylight to make the passage across the Investigator Strait to Kangaroo Island. MrJ had put a rum-line in for Snug Cove which is a quarter the way along the northern coastline, but the wind being more ESE rather than straight E or SE we were being pushed towards the end of the island (the western end). As AR approached closer to the island the wind came off the land more so, enabling us to tack more to port getting us with-in cooee of Snug Cove and being ahead of Banyandah once more. Snug Cove ended up being a little to snug for us. Beautiful little hidey hole that it was, it was only big enough for AR and no other boat (Banyandah) and someone had almost fill the anchorage with small boat mooring buoys making it near impossible for us to anchor with our fouling on mooring lines and the mooring were too small for AR. One look and we were out of there! By that time Banyandah had arrived so both boat followed the coastline till we came to an off the beach anchorage at Hawk’s Nest. The water was calm enough with little to no wind and we were anchored a fair way but it was still a lee shore with surf waves breaking on shore and our bum to the beach waiting for the evening wind change. A little bit hairy for my liking! The next morning both boat headed into American River where we were to meet our new radio friend/operator Carol. American River is a small town tucked into native bush overlooking Eastern Cove and Pelican Lagoon. The hustle and bustle and the crowds that you may be used to are missing but at night the town comes alive with wallabies and possums. Matthew Flinders visited the area in 1802 and named many features including Prospect Hill, Pelican Lagoon, Eastern Cove and Kangaroo Head where his crew were able to obtain their first supplies of fresh meat in months. Sealers and whalers arrived within months of this first visit, many of whom were escaped convicts, runaways etc. They used the island as a base for trading skins and salt. Piracy was common. American River gained its name from American sealers, some of whom built a trading schooner (from native timber) in 1804 at Independence Point on Pelican Lagoon. This was the beginning of the area's shipbuilding history which was continued on by John Buick and Frank Potts in 1842. They were also the first to have farmed the area and their descendants still reside in the district. The sealing trade brought a need for salt for preserving skins. The salt lakes in the area provided the best available salt and an industry which employed hundreds, resulting in a settlement, port and the Island's only railway at Muston on Pelican Lagoon. Gypsum from these lakes was exported from Ballast Head until 1992. In the 1860's rabbits were introduced to the area. Luckily they did not survive and it is thought that goannas ate the young. It was well worth walking the length of the township's coast. Ducks, Swans, Pelicans and other water birds abound. Carol had taken a HF radio call from Banyandah half way across the GAB; Carol does the Coast Watch for Kangaroo Island and she had organized a couple of mooring for both boats even before we had arrived. You really do need a mooring in the river with the strong tidal flow and the wild woolie SE winds that play with the boats. Then after our arrival Carol took us under her wing, introducing us to the local Shed diner night, Hamburger Night and even lent us her 4WD for a day trip of sightseeing. How good was that? As you know I love to play with photos – One day I am looking for a photo of a duck, thinking that there would be plenty in the wild but not so. 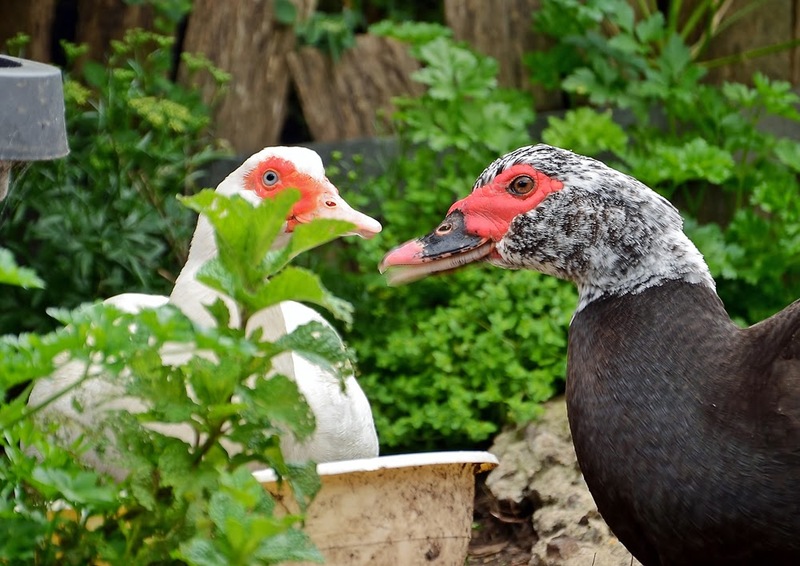 A couple of days later Carol had me up to her neighbour's house; I was crawling around the backyard doing portraits of the pet Muscovy ducks. Ha ha ha, how funny! The day we took our own tour in Carol’s car we first drove to Penneshaw. 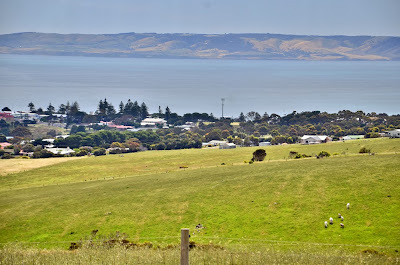 The port settlement of Penneshaw originally known as Hog Bay is situated at the far eastern end of Kangaroo Island. It is the town where the SEALINK ferry service arrives. The neat houses on the sloping hill gave the town a Mediterranean look. The second part of our tour would take us all the way back to Kingscote which was the other side of American River. Kingscote is a smart looking small township that is situated overlooking the waters of the Bay of Shoals to the Northeast and on the Southside the beaches of Nepean Bay. 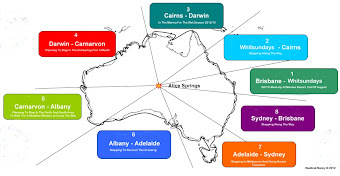 It was the first settlement in South Australia in 1836. There was some idea about it becoming the new free colony's Capital. A shortage of reliable fresh water ended this thought and the migrants that survived the rigours of the trip from England and the hardships faced on Kangaroo Island, moved to what is now known as Adelaide. Kingscote is the Island's main town and its centre of commerce and tourism. There also have a well staffed General Hospital, Health Centre and Lifestyle Village which have seaward views to die for as being located just north of the main fishing jetty, they overlook yachts and fishing vessels that dot the water. A short four days went by spent in American River and then it was time to leave. We did have the opportunity to celebrate out Ozie’s most famous horse race, the Melbourne Cup with our new found friend but as it would happen all too often a short weather window was available for the intrepid sailors off Alana Rose and Banyandah to make passage and to make some mile across Encounter Bay to sail into Cape Jaffa on the South Australian mainland. This was to be another one of those overnight passages that started out in interesting seas which eased back the further we sailed. To leave American River heading east you need to pick the tidal flow going west to east through Backstairs Passage which runs between Kangaroo Island and Cape Jervis on the mainland. The tidal flows are very strong through this passage. We also had an interesting sea to contend with; wind against tide, an easterly breeze on the nose, a very sloppy wave action creating lots of green water over the bow even though the boat was moving along at 9knots with the tide. This lasted till we were well clear of the island turning on a south easterly course and made our passage across to the marina at Cape Jaffa, getting in early the following morning. On this passage we were also blessed with the company of many sea birds and a surprise visit from a pod of dolphins that played between the bows. Just magic! 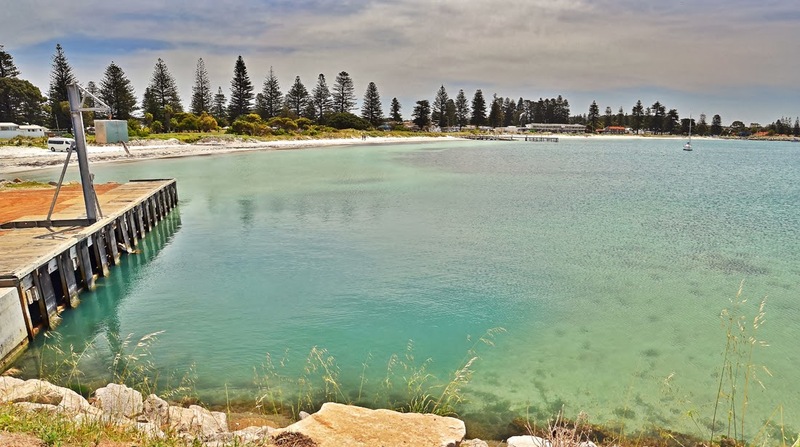 Cape Jaffa, nestled on the southern tip of Lacepede Bay, is famous for its fishing (a commercial southern rock lobster fishing port), seaside lifestyle, natural environment, rural peace and close to the Mount Benson Wine Region. 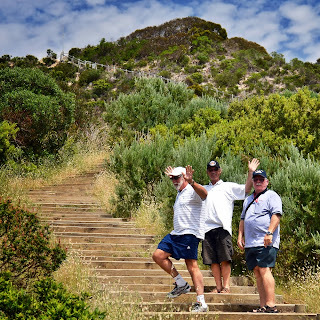 There was most certainly a very relaxed feel about the place as we did discover on a walk one day to the Cape Jaffa Lighthouse Cottage Ruins. 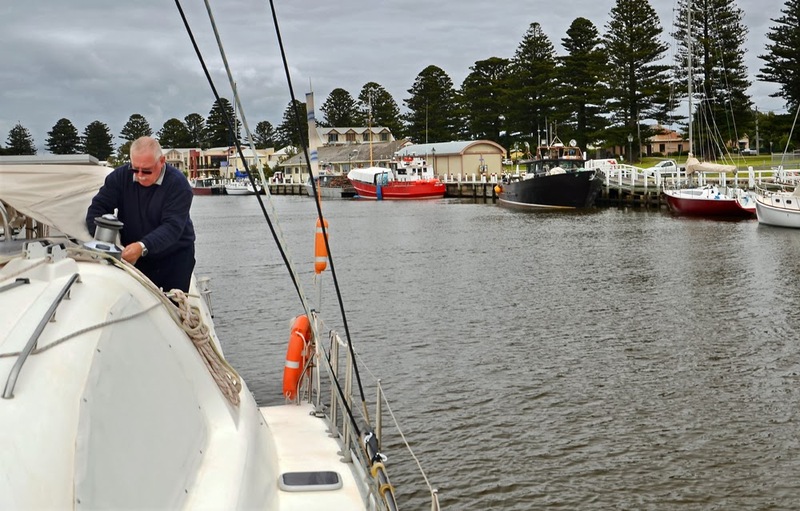 The anchorage at Cape Jaffa is not an anchorage; it is a boat harbour with a residential marina development, like so many that we have seen on our travels but with not much happening as yet and a working harbour, located between the coastal towns of Robe and Kingston SE. 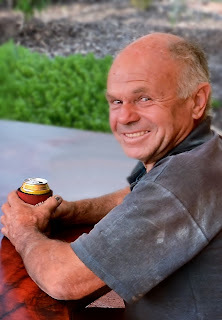 Our mate Leigh who we had sailed the Pacific with lived in Kingston SE. 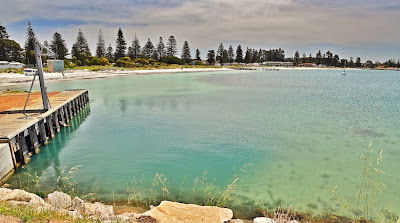 Kingston SE is a small seaside town situated on Lacepede Bay at the entrance to the Limestone Coast Region of South Australia, a region with many natural wonders. Kingston was founded in 1851 as a private town by George Strickland Kingston. Lacepede Bay was named after the naturalist Bernard Lacepede in 1802. At first Kingston was a rough and tumble settlement with a population made up of indigenous people and about 140 settlers. Now the township and district along with Cape Jaffa has a population of around 2200. Commercial activity centres around the lobster, aquaculture and fishing industries, farming, radiata pine production and the rapidly growing wine industry. Leigh had organized a couple of berths for AR and Banyandah through a mate of his, John Goode. John Goode also owned a large cattle farm and a winery in the area. We staying in this marina for a week due to the weather conditions outside and while there Leigh loaned us his tabletop ute. A few days later Glen, off Banyandah befriended a local fisherman, mark Rothall who also loaned us a motor vehicle. The first few days I was to shuttle everyone around in the two seater ute. 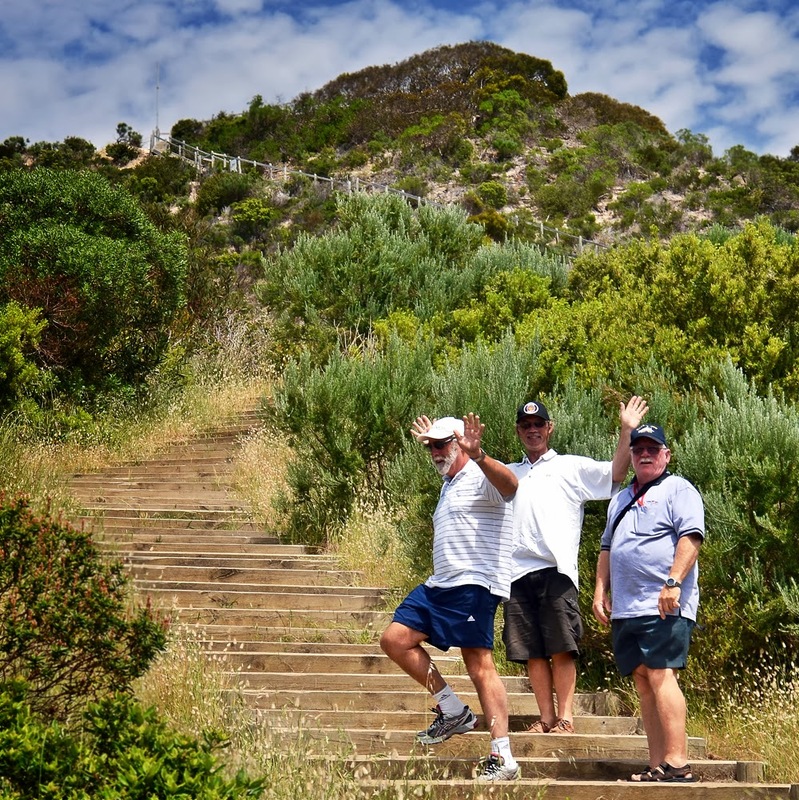 Then we used the Mark’s 4X4 to do a wider trip, sightseeing down the coast to Robe, Rivoli Bay, Beachport and Southend. It was your typical wintery day in spring type weather associated with the southern part of Australia; a heavy cover of cloud that drizzled on and off all day and a wind that blew the chill right through every bone in your body. 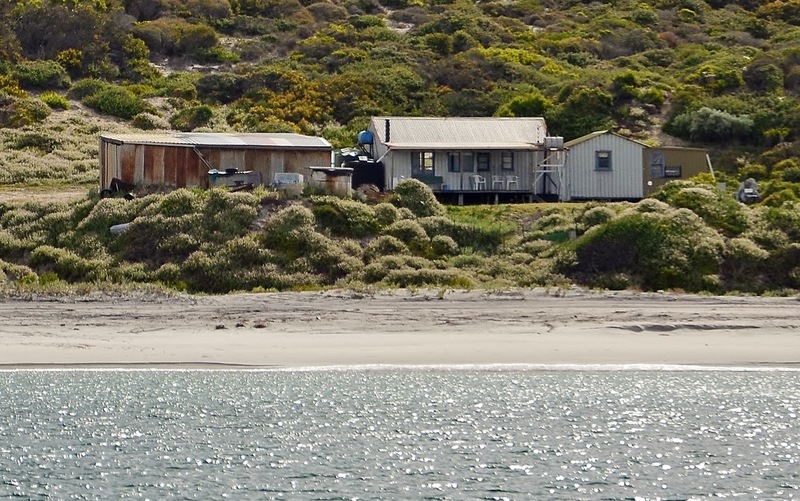 In older times Rivoli Bay was known for being a prominent Whaling Port in South Australia. The station was established in the 1830's by William Dutton and the Henty family and survived into the 1840's. Today the port is a popular tourism destination where whales can still be spotted during the cooler months of the year. In better weather conditions the sea water is a pretty blue making the location an attractive destination along the coastline for tourism. But not this day with a windswept shoreline! The Beach Port jetty is one of the longest jetties in the South Australia. We took the drive out to the wonderful windswept headland of Cape Dombey. On this spectacular rugged coast sits the Cape Dombey Obelisk. An obelisk is a tall, four-sided, narrow tapering monument which ends in a pyramid-like shape at the top. Like Egyptian pyramids, whose shape is thought to be representative of the descending rays of the sun, an obelisk is said to resemble a petrified ray of the sun-disk. The Cape Dombey Obelisk was erected in 1852 and was used to navigate the entrance to Guichen Bay, as well as to store rocket lifesaving equipment. The firing of rockets, carrying baskets to distressed ships to bring passengers ashore, saved many lives. It later assisted passing ships with navigation because its height of 12m (40 ft) makes it visible 20km (12mles) out to sea. The erosion of the land surrounding the obelisk will mean it will eventually fall away. Another treat for MrJ and I while during our stay at Cape Jaffa was to be invited to a local farmers’ (Bert and Janet) place for the afternoon and diner where we were also fortunate to meet our marina berth benefactor John Goode. All three people showed us 150% hospitality plus! Our weeks stay in the Cape Jaffa Marina went by very fast and it was time to be moving on to our next port of call Port Fairy approx 200n/m away in the state of Victoria and another overnighter was enjoyed by all. (!!!!) The boys had collected as much information about the lobster fishing season from as many local fisherman as possible and knew that our passage time would coincide with the beginning of the season making for less crayfish pots out on the sea but there was still a few that both boats had to dodge as we made our way down the lime stone coastline past the infamous Twelve Apostles (a collection of limestone stacks off the shore of the Port Campbell National Park, by the Great Ocean Road in Victoria. 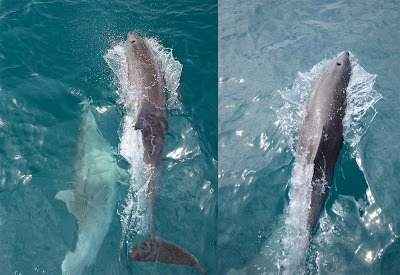 Their proximity to one another has made the site a popular tourist attraction) and around Cape Otway in to Port Fairy. I called our passage “doing the Great Ocean Road by sea”. Port Fairy is a very quaint coastal town, a perfect destination if you're cruising through the south west of Victoria and lies 290 kilometres west of Melbourne. The historic seaside village of Port Fairy is a unique example of a perfectly preserved 19th century shipping port. The little township has retained its old world character and there is an extraordinarily rich variety of architecture. I loved all the quaintness of the cottages along the waterway. 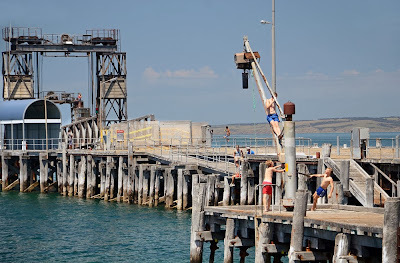 The anchorage is inside the Moyne River mouth, through a narrow entrance and you tie up alongside the ramp jetty near the slipway – note that the maximum draft at both the boat ramp jetty and the slipway jetty is approximately 2 metres. 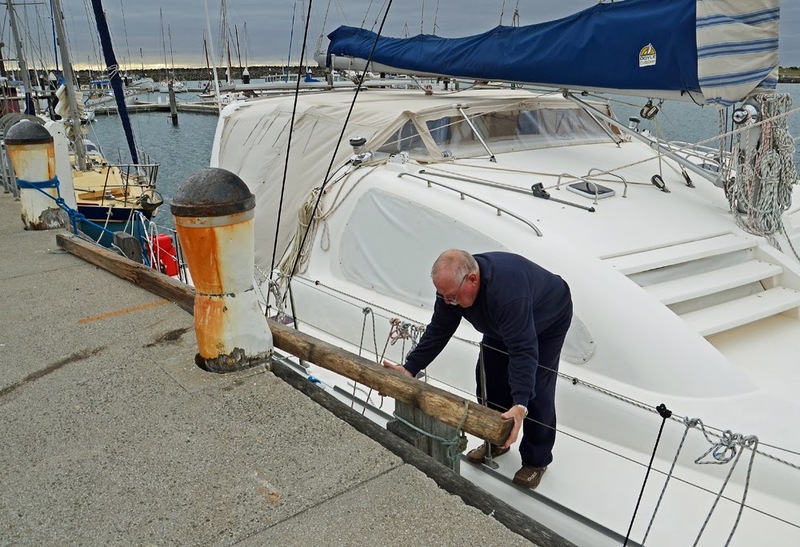 To acquire a berth on the jetty at Port Fairy you will need to contact the Port Manager on (03) 5568 1108 or 0408 529 190. Everything seems small but there was enough room for AR while Banyandah who arrived later had to raft with AR. 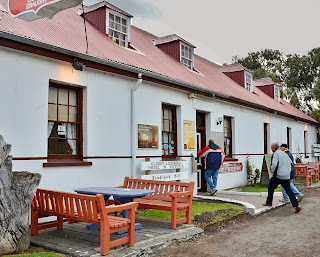 That night we enjoyed a great steak meal at one of the local pubs, The Caledonian Inn or the "Stump" as it is known to locals it was walking distance from the waterfront. Everything was within walking distance. The Stump is the Oldest Continually Licensed Hotel in Victoria which was established in 1844. 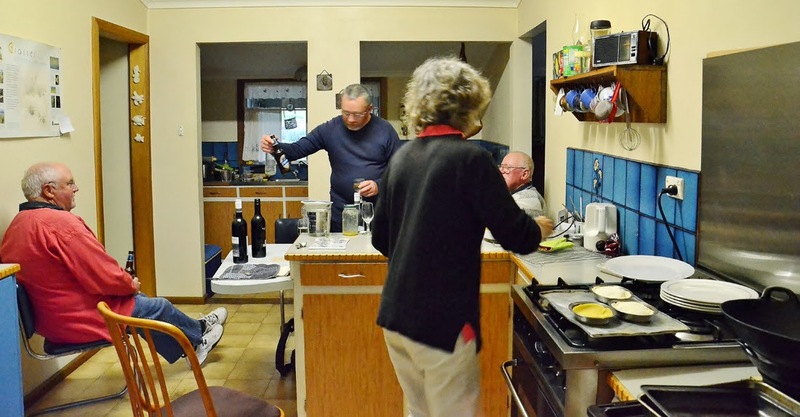 It is located a block away from the centre of Port Fairy and has a unique country style atmosphere welcoming to tourists and locals alike. We stayed only one night in Port Fairy, leaving before daylight to catch the tide and good weather window and then setting a course to take MrJ and I past a part of the Victorian coastline that is famous for the Twelve Apostles or what was left of those magnificent limestone stacks standing vigilantly in the sea after so many hundreds and thousands of years of erosion. Sadly enough we were sailing too far from the treacherous coastline to get a good look. It was a little after 1430h when we had AR rounding Cape Otway with its tall white lighthouse clearly visible to us about ½ mile out and it was1630h when we came alongside the long jetty wall inside Apollo Bay boat harbour. The Apollo Bay boat harbour is a safe blue water haven and is home to the local fishing industry. The harbour did have very bare-minimal, limited facilities for cruising boats. AR was tied to the long harbour wall (it was constructed in the 1950’s) which was not too friendly to our fibreglass hull. The serge from the small swell outside the harbour continued on into the boat harbour making for a lot of movement and shifting between the boat and the jetty wall and especially bad with the change of tidal height. We had hung both of our planks down the side of AR and we still got a small scrape in the fibreglass. I would hate to have to be stuck there in any real bad weather to be bashed up against that wall. 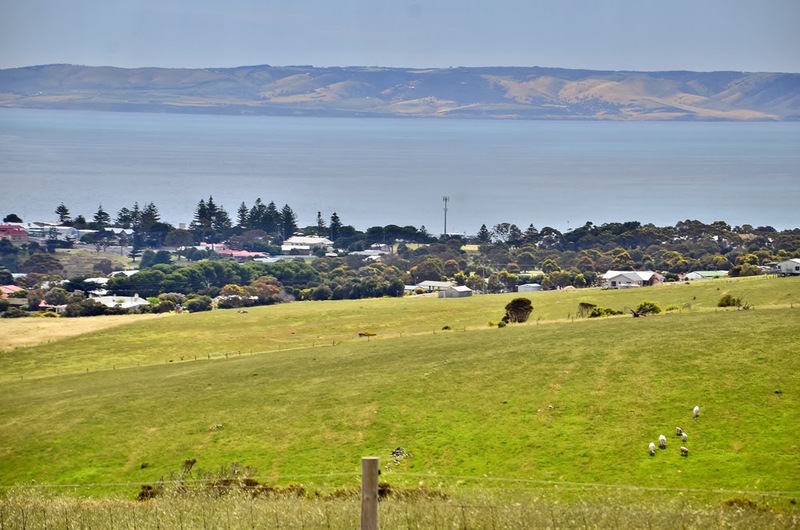 The town of Apollo Bay has a permanent population of 1,200 which swells to 15,000 over the peak summer holiday season. This is due to the close proximity to the Twelve Apostles and the Great Ocean Road which are a must to see for any road tourist travelling through the southern parts of Australia. Once again everything that we needed was within walking distance to the jetty and the people were very friendly. 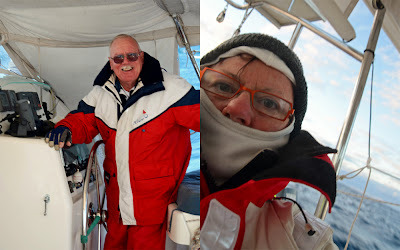 The next morning we left to catch another magic weather window, they don’t come by very regularly in this part of the world, to make our passage across Bass Strait and on to Tasmania down in the roaring 40’s. Bass Strait is one of those bodies of water that has the reputation of being extremely bad when it's bad or quite nice when it's good. The weather forecast for the next couple of days was looking good, but was also looking like turning nasty after that. 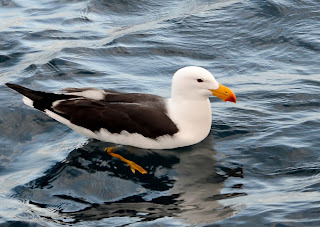 Who knows with the Southern Ocean! 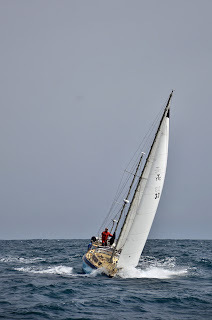 This was MrJ and my first time crossing Bass Strait and it was to be an overnighter, another runner, running in front of the weather patterns. A passage of 270n/m of which we had to motor sail most of the way and missed out on a visit to King Island as we sailed by during the early afternoon of the first day. The wind had started out as a south-easter. 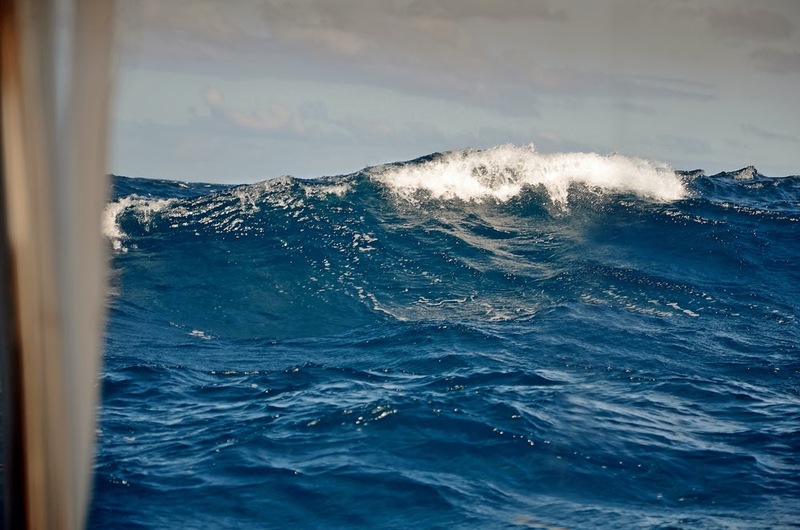 During the passage it swung round to the ENE and we had to hold a course further west then first planned. Once closer to the northern shore of Tasmania we were able to hear more easterly giving us a great rum line for the Tamar River. With the coming of nightfall also came the bitter cold and the sea spray was like ice. Brrrrrrrrrrrrrrrrrrr!!! Overnight we had lost sight of Banyandah but with the morning radio sked we realized that she was only a couple of miles of our beam. This was the boys’ home coming after being away for near twelve month. 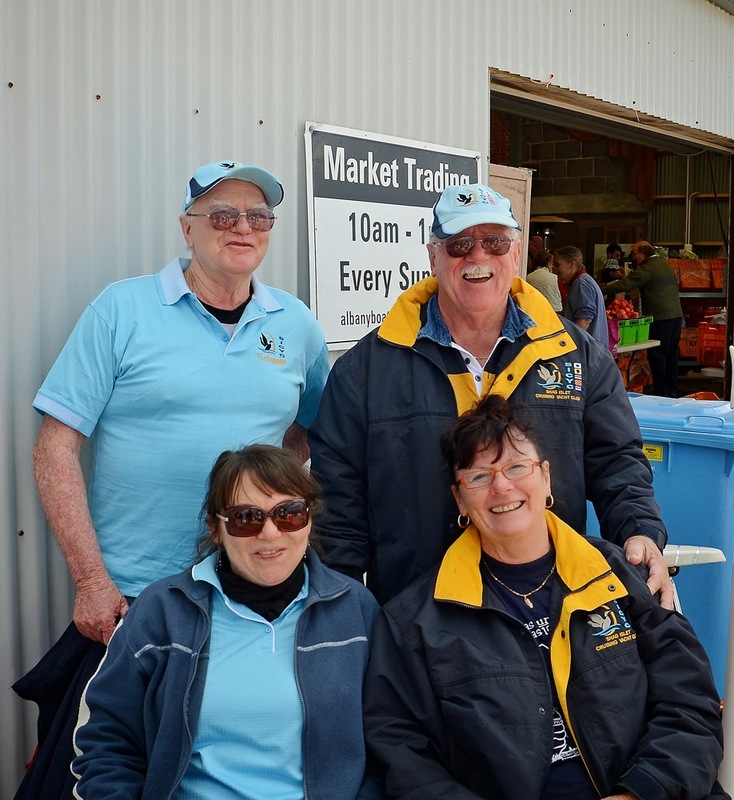 Both boats powered up the might Tamar River to the beauty Point Marina where AR was assisted with getting into her berthing by David and Ron in their club tinnie. We will be in Tasmania for a few months; don't know if we will get down the west coast and back up the east coast before we have to return to the mainland, it is always weather dependent. 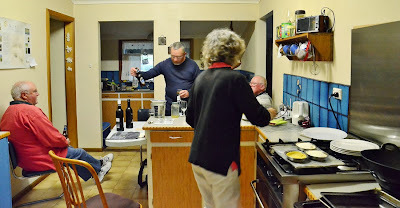 In the meantime I will post some photos and stories about our stay in the Van Diemen's Land. Great post! I look forward to my own circumnavigation one day in Arriba, my Lightwave 38. If possible looking to acquire insurance it could be confusing about what organization is best to buy your insurance coming from. I Interesting post. I have been wondering about this issue,so thanks for posting. online application forms for loans processes fast and our staff's works very hard to get all loans approvals done as soon as possible. Living in Hobart is not an exception from receiving quality loans from our financial company. house repairs etc previous to their following revenue. You will discover corporations of which will let you be lent money in the amount of about as long as you repay it inside guidelines of these pay back construction. Cash Advance Companies Personal Loan Fast Cash Undoubtedly, even though, you will end up paying back in excess of you borrowed because..